As mentioned in yesterday's post, we're working on some new features. 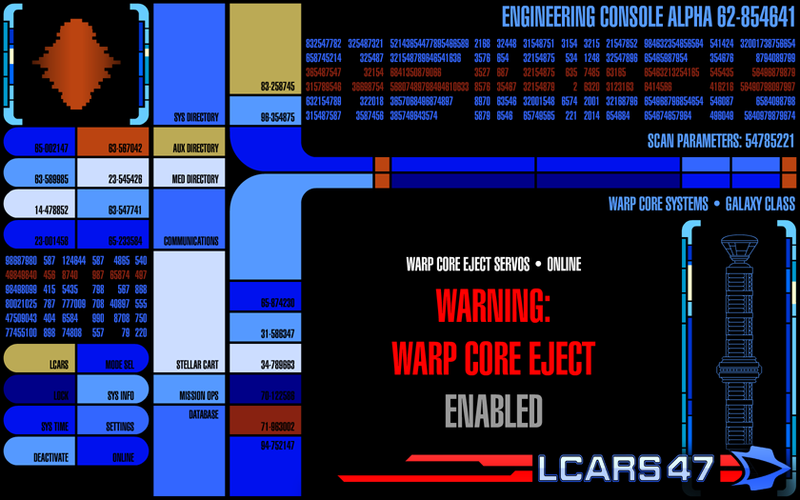 Today, I can go into more detail about the part we're currently working on—the warp core systems monitor. At the minute, I'm just outlining design elements and working out where things should go. To the right, is a preliminary example of the warp core eject system. 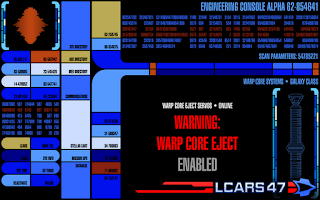 The warp core systems monitor will have numerous other functions such as shutting down the warp core and restarting it. Things like increasing the power output to 110% above normal are a given since sometimes, it's more dramatic than the local wormhole... sometimes. The best part, if you haven't already noticed, is that each warp core system monitor will be totally unique to the class of ship you've installed in Drydock, so if you've installed the Intrepid class, you'll see a warp core fitting of that class. If you've installed the Sovereign class, then you're gonna see a big honkin' Sovereign style warp core (that'll probably take me ages to draw). There is one problem however, we've never really seen an up close Okudagram of warp systems. With this in mind, we're gonna go ahead and throw in some major artistic license. Hopefully, it'll be as faithful to canon as the rest of LCARS 47. In another note, the new features that are dependent on whichever Drydock plugin is installed, will not work unless you update your Drydock class plugin as well (since I'm gonna overhaul that too).